IT service management refers to the process of properly managing IT systems to ensure that all these contribute to the success of a business organization. It focuses more on processes and works quite similarly with the frameworks and methodologies used in some effective process improvement movements including business process management, Six Sigma and total quality management. It also aims to provide a reliable framework that can be used in structuring activities linked to IT and the specific interactions between the business customers and users and the IT technical personnel. The process is also more focused on the operational aspect of the IT management process instead of the development of technology. Many experts also define IT service management as a kind of practice based on a process which aims to help in aligning the process of delivering IT services with the specific needs and requirements of a business organization while also emphasizing advantages to customers. It covers the standard shift from the management of IT as individual components to using process models designed to help deliver effective high quality services. It should also be noted that the IT service management process involves conducting audit by analyzing key performance indicators including the growth and value, budget adherence, risk impact and the effectiveness of communication. If you have longed to work as a certified IT service manager, then you should consider taking up an IT service management certification course and successfully complete it. You can actually take up a reliable and informative IT service management course from Brainmeasures which is now popular for being the most reputable and trustworthy ISO certified online certification and testing company. Enrolling in the IT service management certification course offered by Brainmeasures is a wise move because the comprehensiveness of the IT service management training which you can get out of the program is guaranteed to help you become a real expert in the industry. You can expect this certification course to be effective in honing your skills as an IT service manager. Getting your certificate after completing the course is an indication that you have a high level of knowledge and skills in IT service management so expect numerous business organizations to offer you stable jobs. Brainmeasures IT service management certification program aims to provide benefits to various types of individuals. This is an ideal course for individuals and professionals who need to get a basic understanding about the service management process, those who want to gather information about how they can use the process in enhancing the quality of managing IT services within a business organization and anyone who is greatly interested in getting a career in the IT service management industry. 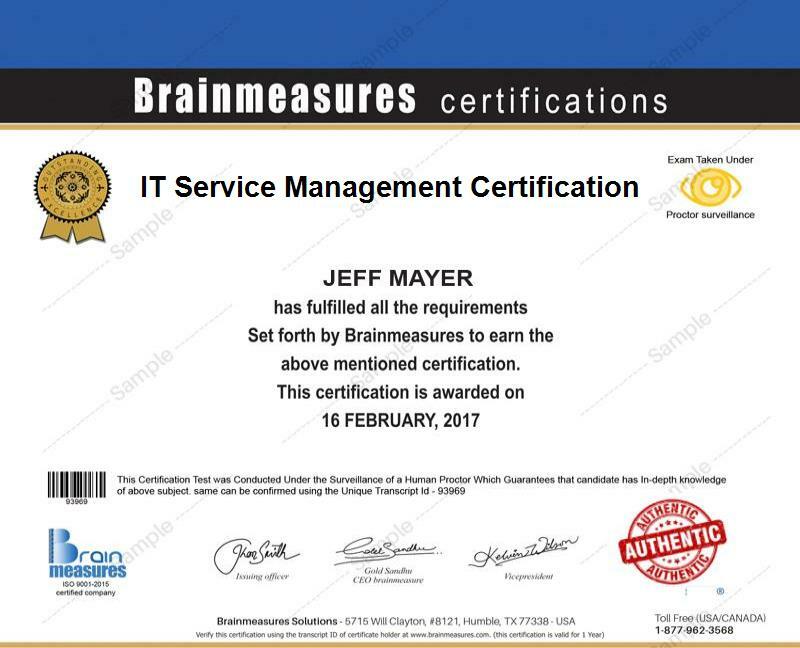 An advantage about enrolling in Brainmeasures is that you can expect the company to admit you into its IT service management certification program without submitting any requirements or meeting certain qualifications. IT service management certification course is highly recommended for those who are aiming to earn a substantial amount of income in the future. If you are an IT service management certification holder, then expect your salary to range from $72,000 to $191,000. You get the chance to receive the highest amount of salary in this industry if you have already established a good reputation in this field.